Awesome Poland and Great Lithuania | Bonjour, amigo! Last summer, my family and I went on an awesome trip. 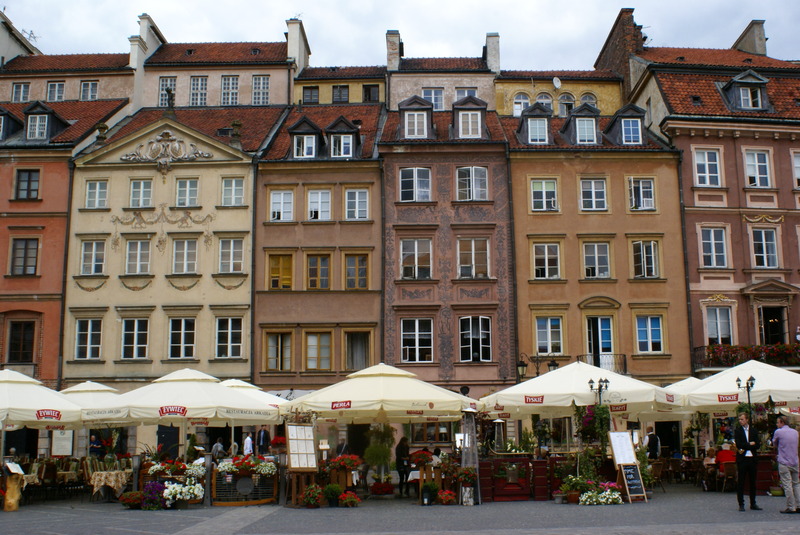 Our first stop: Poland! My dad, my brother, and I met my mom in Warsaw (she had been in Stockholm). Warsaw was ok. My favorite parts were the old town and the palace. Also, there are so many places to get ice cream!! It was crowded but we were still able to get around and get ice cream. Now, how about we go to Krakow? I liked Krakow a lot better than Warsaw. It wasn’t as crowded and people seemed nicer. Krakow is also a lot prettier than Warsaw. We went to this museum (Rynek Underground) that was really cool because it’s underground. I liked seeing the carriages pulled by horses all around the main square (because I love horses). We also went in a cave at the castle to try to find the famous dragon. But it ended up the dragon was outside and it actually breathed fire! We met up with one of my best travel friends, Pola of Jetting Around. Since Krakow is her hometown, she showed us around. 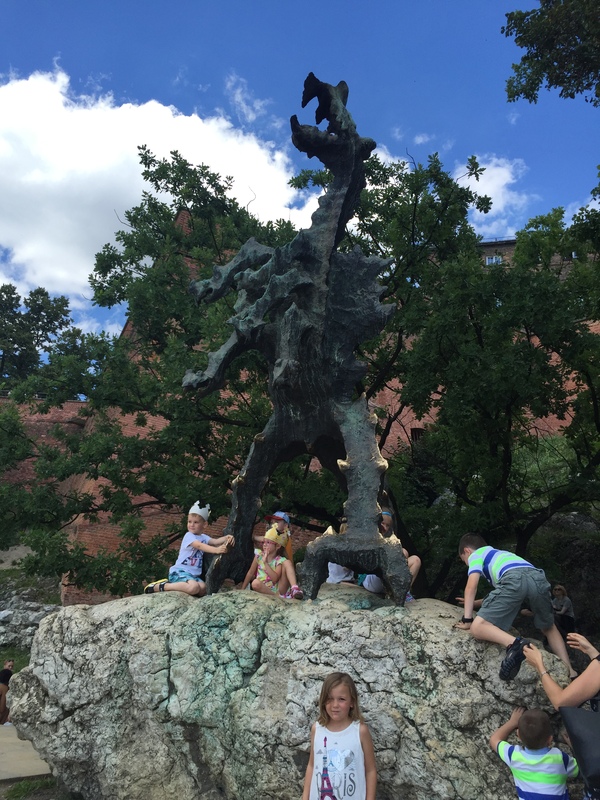 We saw a lot of cool things, including a big head sculpture we could climb in! Anthony and I had fun climbing all over it and it had an echo, too. I also met Pola’s niece, Angi. She is soooo nice and I loved talking with her! I loved Lithuania! It’s so pretty, the people are very nice, and the food is really good. We flew to Vilnius, Lithuania, from Warsaw, and rented a car to drive to the Curonian Spit – but we had to take a boat, too! It was a car ferry from Klaipeda. I thought it was going to be a longer ride than just a few minutes, but it was still cool. Our hotel room in Juodkrante had a loft and that’s where Anthony and I slept. It was so fun! Mommy and Daddy slept in a regular bed downstairs below us. It was like Anthony and I had our very own room, or at least our own clubhouse. We went to the beach in Juodkrante and swam in the Baltic Sea! We tried to make sand castles but it didn’t work out very well because we didn’t have the right equipment. Another fun thing we did was walk through the Hill of Witches. It’s a path through the forest with many wood carvings of characters from Lithuanian folk stories. I thought I heard music in the forest, made by the magical goblins, while we were walking. I called out to them but they didn’t appear. We met new friends in the forest, too, who just happened to also be from Chicago! I loved the Curonian Spit and I didn’t want to leave but we had to go and drive to Vilnius. We stayed in an apartment in Vilnius and down the street was this awesome doughnut shop (Holy Donut). The doughnuts were ginormous! I couldn’t believe that I could not even finish my doughnut because I always finish my doughnuts! The best thing we did in Vilnius was go on a walking tour with a very nice lady named Vilija (of Urban Adventures). Vilija spent all day with us and showed us all the best parts of Vilnius. We even got ice cream with her! In Uzupis, there is a swing hanging from a bridge over the river. We walked through the river and all took turns riding the swing. It was so fun! On another day in Vilnius, we visited a toy museum. It was really cool! There were all kinds of traditional Lithuanian games, and even some from when Lithuania was part of the Soviet Union. Mommy and I had a lot of fun playing all the hockey games. Daddy and I played the action video games (which I didn’t really get). We had such a fun time on this trip. I love traveling with my family! This entry was posted in Europe, Lithuania, My trips, Poland. Bookmark the permalink. Lucia, I’m so glad I got to show you a bit of my home city and that you met my niece. And of course I like Krakow more than Warsaw too. 🙂 See you in Paris next? Lucia I love that you had so much fun with the whole family. Thanks for sharing your adventure! Looks like an amazing adventure. I am so jealous you got to visit with Pola in her hometown.